Victorian Vintage Musings: O'Hara Family History and Tara! O'Hara Family History and Tara! 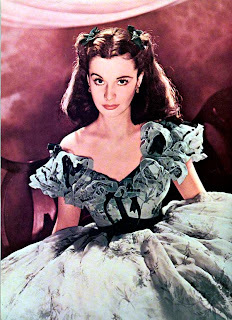 Many of us have read, some of us many of times, and love dearly the story of Scarlett and Rhett and the O'Hara Family. Did you find the Sequel of Scarlet a crime or a great story? I pride myself on being a purists and that noone could truly do justice to Margaret Mitchel's heroine, but I must admit I did enjoy Scarlet both the book and the made for TV Movie. Now whether Margaret Mitchel would have created her Scarlet in the same way, we will never know, but the second Scarlet was a woman of great strength and ambision and pride in the family O'Hara. In delving deeper into my own Irish Family History I am fascinated in reading about the real family O'Hara as well as the land of Tara, so beloved by our Scarlett and her father. A place that was always home! So what about the O'Hara Family. There are many stories on this ancient family name, some of which come from the same county, Sligo County Ireland as my ancestors. Which makes it all the more fun. Below is information from an O'Hara Family Website. This famous Irish clan originates from County Sligo before the 10th century a.d. It is said that they descend from Eaghra, chief of Leyny, and a member of the household of Ollum, King of Munster. In the 14th century the clan was split into two septs, and the chiefs of each branch were known as O'Hara Buide (the brown faced one) and O'Hara Reagh, the rough faced one! The centre of each sept was at the villages of Colloney and Ballyharry, a transposed spelling of 'Ballyhara'. The O'Hara clan were very large landlords in Sligo, at one time having over 20,000 acres at Coopers Hill and Annaghmore. The O'Hara's have been both supporters of the government of the time and revolutionaries in equal measure. The clan have suppled at least three bishops, and were rewarded in 1706 by the granted of the title Baron Tyrawley. However in 1798 James O'Hara was one of General Washington's supporters in the American war of Independance 1771 - 1783, whilst Kean O'Hara was a participant with Lord Edward Fitzgerald in the 1798 rebellion. Both escaped to France, where they served as officers in the armies of Napoleon Bonaparte. The actress Maureen O'Hara, was born a Fitzgerald. The firrast recorded spelling of the family name is shown to be that of Dermot O'hEaghra, which was dated circa 1350, in the "Composition book of Connacht", during the reign of King Edward 111, of England, 1327 - 1377. Surnames became necessary when governments introduced personal taxation. In England this was known as Poll Tax. Throughout the centuries, surnames in every country have continued to "develop" often leading to astonishing variants of the original spelling. 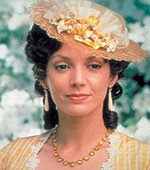 Tara was the plantation of the O'Hara Family. Tara was the most important thing in Scarlett's life. Scarlett found her strength in Tara. However, the real Tara, was much more than a Southern Cotton Plantation. One interpretation of the name Tara says that it means a "place of great prospect" and indeed on a clear day it is claimed that features in half the counties of Ireland can be seen from atop Tara. In the distance to the northwest can be seen the brilliant white quartz front of Newgrange and further north lies the Hill of Slane, where according to legend St. Patrick lit his Pascal fire prior to his visit to Tara in 433 AD. Early in the 20th century a group of Israelites came to Tara with the conviction that the Arc of the Covenant was buried in on the famous hill. They dug the Mound of the Synods in search of the Arc but found only some Roman coins. Official excavation in the 1950s revealed circles of post holes, indicating the construction of substantial buildings here. A new theory suggests Tara was the ancient capital of the lost kingdom of Atlantis. The mythical land of Atlantis was Ireland, according to a new book. There are a large number of monuments and earthen structures on the Hill of Tara. The earliest settlement at the site was in the Neolithic, and the Mound of the Hostages was constructed in or around 2500BC. There are over thirty monuments which are visible, and probably as many again which have no visible remains on the surface but which have been detected using special non-intrusive archaeological techniques and aerial photography. A huge temple measuring 170 metres and made of over 300 wooden posts, was discovered recently at Tara. Only two monuments at Tara have been excavated - The Mound of the Hostages in the 1950s, and the Rath of the Synods at the turn of the 19th-20th Centuries. Click here to see a comprehensive map of the monuments on Tara. Click here for the Tara photo gallery. Sitting on top of the King's Seat (Forradh) of Temair is the most famous of Tara's monuments - Ireland's ancient coronation stone - the Lia Fail or "Stone of Destiny", which was brought here according to mythology by the godlike people, the Tuatha Dé Danann, as one of their sacred objects. It was said to roar when touched by the rightful king of Tara. Formerly located just north of the Mound of the Hostages (see map), it was moved to its current site after the Battle of Tara during the Irish revolution of 1798 to mark the graves of 400 rebels who died here. Some say the true Stone of Destiny was formerly the Pillow of Jacob from the Old Testament. They also claim it was flat and that it was moved from Tara by King Fergus of Scotland and was named the Stone of Scone which then became the coronation stone of British kings at Westminster Cathedral. Many historians accept that the present granite pillar at Tara is the true Stone of Destiny, but a number of people have argued that the Stone of Scone is in fact the real thing. One legend states that it was only one of four stones positioned at the cardinal directions on Tara - and it is interesting to note that the Hall of Tara, the ancient political centre of Ireland, is aligned North-South. Cathair Crofhind ('twas not amiss), was its name under the Tuatha De Danand, till there came Tea, never unjust, the wife of Erimon lofty of mien.Round her house was built a rampart, by Tea daughter of Lugaid;she was buried beyond the wall without, so that from her is Temair named.The Seat of the Kings was its name: the kingly line of the Milesians reigned in it: five names accordingly were given it from the time when it was Fordruim till it was Temair. Read the rest here. Download your FREE Tara wallpaper (pictured above) which contains the verses on left. The "Mound of the Hostages" is a megalithic 'passage tomb' and is the oldest monument on the hill of Tara, dating to about 2,500BC. The name "Mound of the Hostages" derives from the custom of overkings like those at Tara retaining important personages from subject kingdoms to ensure their submission. One of the legendary kings of Tara was named Niall of the Nine Hostages in recognition of the fact that he held hostages from all the provinces of Ireland and from Britain. The passage at the Mound of the Hostages is short, and is aligned on the cross-quarter days of November 8 and February 4, the ancient Celtic festivals of Samhain and Imbolc. Just inside the entrance on the left is a large decorated orthostat. This picture shows the short passage at the Mound of the Hostages at Tara. As a solar construct it is not as accurate as other passages, which are notably longer, but according to Brennan (The Stones of Time, 1994) the daily changes in the position of a 13-foot long sunbeam are more than adequate to determine specific dates. The passage would, without any doubt, also capture the light of the Full Moon at certain times in the 19-year cycle, specifically the minor standstill rising position. In the churchyard at Tara there are two standing stones, which are believed to be ancient – remnants of a time when there were many stone monuments on Tara. The taller of the two stones is thought to feature a figure of the Celtic fertility god Cernunnos, and is similar to many of the 'Sheela na Gig' representations found across Ireland. These stones may date to the Neolithic period, although are more likely to have their origin in the Bronze Age. In the early histories it was noted that on this section of the hill there once stood a monument called "The Cross of Adamnan" commemorating a seventh century saint who called a church synod at Tara to enact laws that gave greater rights to women. The ancient documents about Tara named many standing stones on this section of the hill – Dall, Dorcha, Maol, Bloc and Bluicna. The Standing Stones of Tara also recall the legend that candidates for the High Kingship of Tara had to drive their chariots toward two sacred stones standing closely together. They remained closed for the non-accepted candidate and opened a path only for the rightful king. 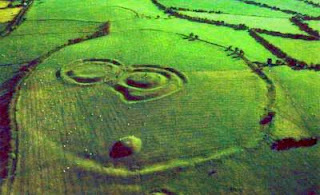 The above photo shows the great 'Banqueting Hall' at the Hill of Tara. Click here to see great aerial pictures of the Hill of Tara. Mythical Ireland has also reproduced the ancient tale about how Tara got its name, from the old collection of placename stories in the Dindshenchas - click here to read this tale. The Hill of Tara is under threat from the construction of a new motorway, the M3, which is currently being built and will disect the tranquil Tara-Skryne valley and pose a threat to many monuments which will doubtlessly be uncovered during its construction. Already a unique hengiform site has been revealed at Lismullen, and this has stopped work on the motorway. Read up-to-date news about the whole M3 saga on out "Sites Under Threat" forum. Read what the experts said about the M3 here. Support for this expert group has come from a number of sources, not least the South African born Oscar-winning actress, Charlize Theron. 'Tara', The Discovery Programme, Government Publications 1995.Ordnance Survey Letters Meath, John O'Donovan, 2001.The Tara Walk, Michael Slavin, 2000.The Book of Tara, Michael Slavin, 1996, Wolfhound Press.Martin Brennan, The Stones of Time, 1994, Inner Traditions.The Legend of Tara, Elizabeth Hickey, 1988.